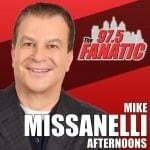 Listen to Farzetta and Tra in the morning this week to win a pair of tickets to the Met Philadelphia Boxing Series featuring undefeated welterweight Malik Hawkins taking on battle-tested Fabian Lyimo, Friday, April 26th at the Met Philadelphia. Tickets available at TheMetPhilly.com. Marc, Tra, Bob, Jamie & Sam all live the morning after a story comes out from the NY Daily News saying that Brett Brown has "lost" the locker room & raises what we think are some unfair questions about Ben Simmons! We also spoke Carson Wentz & the NFL draft with Adam Schefter from ESPN! Marc, Tra, Bob, Jamie & Sam discussed the Phillies 10-run first inning against the Mets, Chris Sheridan's insane article on the Sixers & more! Friend of the show, Diane, joined the show in the last segment to talk about her famous pulled pork and homemade peanut butter & chocolate eggs! Marc, Tra, Bob, Jamie & Sam discussed the Phillies 10-run first inning against the Mets, Chris Sheridan's insane article on the Sixers & more! Adam Schefter joined the show to discuss Chris Sheridan's recent article on the Sixers in the NY Daily News, the NFL Draft coming up next week & more!